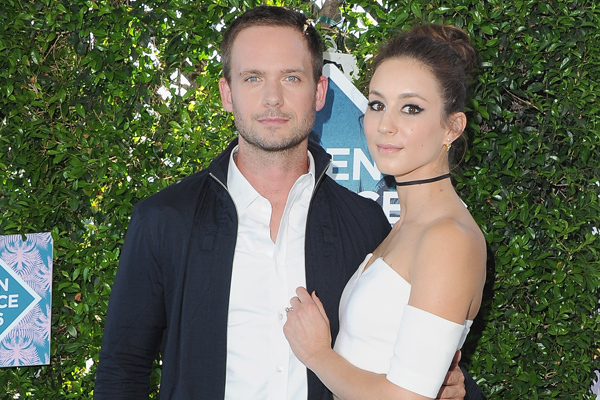 Congratulations are in order for Patrick J. Adams and Troian Bellisario who just got married! The happy couple tied the knot on Saturday and the photos are completely breathtaking. Adams and Bellisario are married, People confirmed, and the duo had a weekend to remember. Yes, we said weekend and not day, because their wedding lasted for more than a day. It was amazing and we are so beyond jealous. The Suits stars proposed to Bellisario back in February 2014 and two and a half years later, the two are officially man and wife. We are so happy for them. According to the publication, the Pretty Little Liars actress and her husband got married in a Southern California ceremony. Instead of gifts the sweet couple encouraged their guests (all 200 of them) to donate to either the SickKids Hospital and David Suzuki Foundation. Seriously, could these two be any cuter? Okay, now lets get to the actual wedding, because it was ah-mazing. For starters guests spent the weekend “glamping” in camping tents that were both functional and fabulous. Come on, this place is totally magical. When the couple arrived to the ceremony, they showed up in style — driving in a converted school bus. The bus was decorated with paint and said, “Almost Married,” on the back. So freaking cute! The groom even drove guests in the bus, because this was the best wedding ever. The night was full of romance with the help of candles on the path to the ceremony and vintage wooden chairs for seating, People reported. The couple exchanged vows in the forest setting in front of old oak trees. It was basically a hippie’s dream wedding and we totally approve. Bellisario looked like a gorgeous white goddess in her Cortana gown, which had sheer sleeves and a pretty train. She wore a beautiful headpiece made by Amaroq, Hello reported, and donned a veil for the ceremony. After the couple said, “I do,” they went to the beach to take pictures and from the looks of it, they were picture perfect. There was a minor issue when Bellisario’s dress caught some leaves, but Adams was there to save the day. The reception was full of drinks, food, and of course wonderful place settings. It was pretty much a fairy wonderland and we wish we could’ve been there. The whole Pretty Little Liars family was in attendance including Bellisario’s onscreen love Keegan Allen who posed with the bride in what looks like a second gown. It was gold with lots of sparkles! Ashley Benson and Ian Harding also posed with Allen as they enjoyed the camp-themed night. PLL creator, Marlene King, posted a fun picture of the bride and groom entering the reception and their faces say it all. They are all smiles. Congrats to the happy couple on their wedding!